It has been said that Johan-Barthold Jongkind had a “talent for friendship” that both formed and enriched his emotional, professional—and sometimes economic—life. [i] As the sixth child in his family, this gift of friendship may well have been part of his inheritance as second youngest child. Jongkind was born on June 3, 1819 in Lattrop, Holland to Wilhelmina-Jacobia van der Burght (1783-1855) and Gerrit-Adrianus Jongkind (1776-1856). Two years later, the family moved to Vlaardingen on the Meuse River, just outside the port of Rotterdam where Jongkind’s father worked as a customs tax collector. The town of Vlaardingen, with a population of 6,000 in 1830, offered all the benefits of a small community plus the excitement of a growing port city. For the Jongkind children, this must have provided ample opportunity for exploring both on land and sea, learning to handle fishing boats and watching the international river traffic as Europe embraced industrialization after the end of the Napoleonic era. The young Johan started primary school in 1825 and completed his formal education ten years later in 1835. During those years, in 1829, his eighteen-year-old brother Laurens-Christiaan died unexpectedly. After leaving school in 1835, Jongkind accepted a position as a clerk for Pieter Verkade, a local solicitor. Simultaneously, his family moved to the town of Gouda, fifteen miles northeast of Rotterdam, leaving sixteen-year-old Johan to make his way independently in Vlaardingen. It didn’t take Jongkind long to realize that law was not his profession, and by 1837, he was enrolled at the Tekenacademie in The Hague. There he began his study of art with Andreas Schelfhout (1787-1870), a well-respected landscape painter who had just returned from England where he focused on the study of John Constable’s landscapes. Schelfhout not only taught Jongkind the basics of his art, but also introduced him to plein air painting, encouraging the young artist to study nature and to use watercolor sketches as a tool for capturing an image. Jongkind worked closely with Schelfhout, and soon became comfortable in the environment of the academy. In particular, he and fellow-painter Charles Rochussen (1814-1894) became lifelong friends during this period, tramping the countryside in search of landscape motifs and exploring the aesthetic ideas of the 1830s in Holland. Although this decade was awash in romanticism in England and France, the landscape tradition of Holland was rarely challenged. Schelfhout’s paintings, for example, reflect the profound influence of Constable’s contemporary work, but his foundation remained the work of seventeenth century Dutch masters such as Jacob van Ruisdael, whose moody poetic evocations were already inherently “romantic” in tone. Not surprisingly, Jongkind’s early work reflects this tradition as well. These early years were marked by great energy, but also by financial hardship. Beginning in 1842, Jongkind decided to organize raffles in order to sell his artwork, a modestly successful marketing strategy that he would repeat several times during his early career. He achieved recognition as a promising young artist when his painting was accepted for the annual exhibition of the Amsterdam art society, Arti et Amicitiae, in August 1843. Nonetheless, it was clear that he needed a steadier income if he was to continue to work as a professional artist. In 1843, at the urging of Rochussen whose father was a wealthy businessman, Jongkind applied for a grant from King Willem-Frederik II; he received 200 florins. Both Rochussen and Schelfhout recommended that Jongkind study in Paris, and particularly suggested that he work with Eugène Isabey (1803-1886), at that time an official painter at the court of Louis-Philippe. In November 1845, Jongkind and Isabey met in person at the inauguration of an equestrian monument of Guillaume le Taciturne in The Hague, quickly establishing a rapport that would evolve into a long-term friendship. The proposed move to Paris was funded by the continuing support of the Dutch government, in part on the recommendation of Ludolph van Bronkhorst, a friend of Rochussen. By March 1846, Jongkind was ready to move, and as it happened, Isabey traveled with him from The Hague to Paris where he would begin the next phase of his life. Jongkind’s first home in Paris was a 7 Place Pigalle not far from Isabey’s studio in Montmartre. There, he not only met many men who would become friends and colleagues, including Théodore Rousseau, Théodore Chassériau and Eugène Ciceri, but also had the luxury of practicing his French with a sympathetic audience. Outside of Isabey’s studio, he met Jozef Israëls, who would return to Holland in 1847, as well as Isidore Pils during this first year in Paris. The Salon of 1846, which opened at the Louvre several weeks after his arrival, introduced Jongkind to the scope of French art, and gave him a sense of how his own work might fit into the elaborate panoply. The year 1847 brought additional opportunities, including Jongkind’s submission of a painting to the annual exhibition at The Hague. More significant was his introduction to the provinces of Normandy and Brittany in northwestern France. Together with Isabey, he spent July and August roaming the beaches and cliffs of this region, painting numerous watercolors as well as oil sketches. For Jongkind, this landscape was both familiar and entirely fresh; the flat expanses of beach were not so different from Holland, but the steep cliffs and dramatic rock formations offered previously unknown vistas. It was the beginning of an enduring fascination with this part of France. 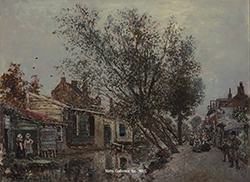 On his return to Paris in the fall, Jongkind moved to a new place in Montmartre at 2 Impasse Cauchois, which he shared with his countryman and fellow landscape painter, Martinus Adrianus Kuytenbrouwer (1821-1897). Living in the same building was Félix Ziem (1821-1911), who had recently arrived in Paris from Burgundy, and who would also become a good friend. Life in Paris became unexpectedly tumultuous at the year closed with public demands for political reform growing increasingly vehement. By February 1848 the situation became critical and the citizens of Paris took to the streets, raising barricades and insisting on change; on February 23, 1848, the “citizen-king” Louis-Philippe abdicated and fled to England. The Second Republic began governing on February 28, but tensions remained high throughout the year. There is no record of Jongkind’s involvement in these events, but as a resident of Montmartre, he was surrounded by impromptu barricades and citizens fighting in the streets—a state of affairs that must have been disconcerting at best. Perhaps because of this social upheaval, Jongkind’s mother pressed him to return home for a visit, a request with which he complied in June, just as the Dutch government was itself transforming peacefully into a constitutional monarchy under the leadership of liberal reformers there. Jongkind spent the next six months in Holland, staying with his former teacher Schelfhout, and painting a series of fifteen watercolors for the Prince of Orange. He set out to return to France in December, but ultimately remained in Brussels for five months because of a cholera outbreak in Paris. The time in Belgium seems to have been productive, however, and his submission to the 1849 Salon was accepted. At the same time, the Prince of Orange became King Willem III, and allocated a 1000-florin stipend to Jongkind. This enabled him to move his studio to 21 rue Bréda while maintaining his residence at 1 Place Pigalle in 1850. The next few years brought success and stability. Jongkind was painting prolifically and his work was beginning to sell. Adolphe Beugniet (1821-1893), who had opened a gallery only two year earlier, began to handle his work, and the Salon exhibitions were more open to a broad range of paintings than during the reign of Louis-Philippe. In the summer of 1850, Jongkind and Isabey again traveled to Normandy and Brittany together; and in the summer of 1851 Jongkind returned on his own, producing unexpectedly large oil paintings. Back in Paris, the social turmoil created by the December 1851 coup d’état by Louis-Napoléon Bonaparte seems to have made little impression on Jongkind, who focused instead on producing three large paintings for the spring Salon. All three were accepted, and he won a third place medal for his work. The following year, however, began a sharp decline in Jongkind’s fortunes, both financial and personal. His stipend from the Dutch government suddenly ceased—without explanation—and then he received news of his mother’s failing health. In 1854, his brother Jacobus died, and Jongkind’s own health was increasingly compromised by over-indulgence in alcohol as well as periodic bouts of depression. Friends and family alike encouraged him to settle down and marry; hoping perhaps that this would provide him with a sense of security and comfort. This dismal situation was further exacerbated when Jongkind was chastised by his Dutch compatriots for exhibiting in the French section of the 1855 Exposition universelle in Paris. His depression deepened in the fall when his mother died, and his financial problems became unsustainable. Although his paintings were selling reasonably well, he simply did not make enough income—or manage it sufficiently well—to earn a living in Paris. As it turned out, Jongkind remained in Holland, settling in Rotterdam, for another five years. He worked constantly, painting from nature in the surrounding countryside and producing more and more oil paintings rather than watercolors. Much of this work was sent back to Paris to Adolphe Beugniet and also to the art dealer Pierre-Firmin Martin, who would become one of Jongkind’s most active promoters. It was a time of isolation and loneliness for the normally extroverted artist; he missed his friends and the pleasures of life within a thriving arts community. By 1857, he was able to organize a visit to Paris in July which seems to have rejuvenated his spirit considerably. He met old friends and made new ones, including Adolphe-Félix Cals (1810-1889) and the sculptor Pierre-Bernard Prouha (1822-1888), both of whom would remain good friends for decades. In addition, it was during this visit that Jongkind first met Gustave Courbet (1819-1877) at a dinner party hosted by a mutual friend, Eugène Picard. Fresh from his succés de scandale with the painting of Young Ladies on the Banks of the Seine (Summer) at the 1857 Salon, Courbet was well established as a leader of the Realist faction within the French art world; the artistic currents were clearly moving in new directions, and Jongkind may well have felt encouraged by this enthusiastic attitude among his friends and colleagues. 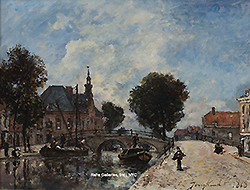 Back in Rotterdam by the end of October, Jongkind continued to paint prodigiously, and to send an increasing number of artworks to Pierre-Firmin Martin in Paris. Martin took the initiative to send one of Jongkind’s paintings to the Salon de Dijon in 1858, where it won a second class medal; and another, Paysage Hollandais, effet de soleil couchant, to the Paris Salon in 1859, where it won a third class medal. As in the earlier part of the decade, Jongkind’s works were receiving positive recognition and selling reasonably well, but his financial ineptness kept him mired in debt. Acknowledging that Jongkind was unlikely to master the art of budgeting, his Paris friends decided to organize a sale of his works at the Hôtel Drouot auction house so that he could return to France permanently. Martin, Cals and the art collector Count Doria arranged the sale which took place on April 7, 1860; 86 artists and collectors contributed their works for the benefit, including Camille Corot, Charles Daubigny, Alexandre-Gabriel Décamps, Narcisse Diaz de la Peña, Gustave Doré, Jules Dupré, Henri Harpignies, Théodore Rousseau, Constant Troyon and Félix Ziem. This generous support yielded 6046 francs and 80 centimes. Cals gathered up the proceeds and set out for Rotterdam to pay Jongkind’s debts and bring him back to Paris. Jongkind settled briefly into an apartment at 69 rue Saint-Nicolas d’Antin that Martin had found for him before moving to the building where he would find a permanent home at 9, rue de Chevreuse in June. (Today, the address of this building is 5, rue de Chevreuse.) The motivation behind this move, leaving behind the familiar neighborhood of Montmartre for the left bank quarter of Montparnasse, was a woman named Joséphine Borrhée-Fesser, whom Jongkind had met at Pierre-Firmin Martin’s gallery in May. Mme Fesser had meet Martin through mutual friends in 1845 and had stopped to visit him on a day when Jongkind also happened to be there. The two struck up an immediate friendship which evolved swiftly into a close relationship that would last the rest of their lives. Joséphine Borrhée-Fesser (1819-1891) was born in Namur, Belgium and arrived in Paris to study drawing in 1839; six years later, she married a chef, Jean François Alexandre Fesser and they moved to the Nivernais region of central France. Mme Fesser returned to Paris in 1855 while her husband remained in the Nivernais. Her influence on Jongkind was both positive and long-lasting; she was his emotional anchor and almost certainly, a financial advisor who guided him to a more sensible attitude toward managing his income. The relationship with Mme Fesser was indeed a turning point in Jongkind’s life. The 1860s proved to be a critical decade, not only for Jongkind, but for the history of western art. The overlapping circles of Realist and Barbizon artists came together in January 1862 to form the Société des aquafortistes (Society of Etchers) under the leadership of François Bonvin. 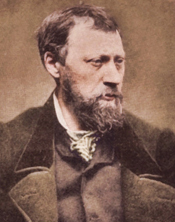 The founding members included not only Jongkind, but Félix Braquemond, Corot, Daubigny, Alphonse Legros, Edouard Manet, Charles Méryon, Jean-François Millet, Théodule Ribot, James Whistler and his English brother-in-law, Francis Seymour-Haden who was part of the British etching revival as well. The importance of the Société des aquafortistes lies not only in its work of promoting etching as a serious art form, but equally because it was an early model of cooperation among independent artists whose work straddled the line between mainstream academic taste and experimental explorations. This perception was reinforced by Charles Baudelaire’s in his essay, “Painters and Etchers”, published on September 14, 1862 in Le Boulevard. His description summed up Jongkind’s etchings at the time: “At the same publisher’s [Cadart] M. Jongkind, that charming and unaffected Dutch painter, has placed several plates in which he has enshrined the secret of his memories and reveries—as calm as the banks of the great rivers and the horizons of his noble country; curious abbreviations of his painting, sketches which will be intelligible to any amateur used to deciphering an artist’s soul in his most rapid scribbles. ‘Scribbles’ is the term used a little frivolously by the Diderot in characterizing the etchings of Rembrandt...” [iv] Baudelaire’s comparison with Rembrandt underscored the importance he attached to the etching revival that was unfolding in the 1860s, noting elsewhere in the essay that this medium encouraged the depiction of contemporary life in a suitably brisk style. The 1863 Salon exhibition the following spring provided even more evidence that the art world was in the midst of profound change as the conservative academic jury rejected a record number of paintings, accepting only 30% of the submissions. In response to this mass repudiation of their work, artists banded together to protest, calling on the government to intervene. Once he realized that the commotion would not die down, Emperor Napoléon III determined that the rejected art works should be displayed in a separate exhibition adjacent to the official Salon show so that the public could make its own judgement about the merits of the art. Thus forced to hang the offending paintings, the Salon jury hoped to justify their own decisions by displaying the most “unworthy” paintings in key locations; this included Manet’s Luncheon on the Grass and Whistler’s Symphony in White No. 1: The White Girl. Jongkind’s work did not come in for quite the virulent public abuse that Whistler and Manet suffered, but his three landscape paintings were singled out by art critic Louis Leroy for particular scorn. [vii] Needless to say, the exhibition only served to solidify the diverse group of Realists in their conviction that canvases depicting contemporary life were appropriate subjects for serious painting. The remaining years of the 1860s were less dramatic, but no less productive. In the summer of 1863, Jongkind and Mme Fesser returned to Normandy, settling for a few months at Honfleur; the following summer, they repeated that itinerary, joined by Boudin and Monet in July. In September, Jongkind and Monet worked side by side painting the same motifs at Honfleur. In August 1865, Jongkind and Mme Fesser made their last painting trip to Normandy, choosing to explore Belgium and Holland during the summer and fall months from 1866 through 1869. Jongkind’s income from his art also continued to expand during this period. In addition to regular exhibitions in Paris, he submitted paintings to salons in cities such as Bordeaux. Gradually, his sales increased and he began to receive positive critical reviews. This hard-won financial security and personal contentment was disrupted on July 19, 1870 when Napoléon III declared war on Prussia. Although the French army was defeated, and Napoleon II captured, on September 2, 1870, the Prussian troops had yet to conquer the people of Paris who refused to accept their rule. Jongkind and Mme Fesser left Paris on September 13, traveling first to Chartres, then west to Nantes, and finally back eastwards to the Nivernais region where M. Fesser was living. The rationale behind this somewhat erratic tour remains unclear, but it is likely that they were simply looking for safe haven from the war. Ironically, they returned to Paris on March 26, 1871 during the height of the siege against the city by the Prussians. Jongkind continued to work throughout the turmoil—just as he had during the revolution of 1848 and the coup d’état of 1852. In fact, he turned his attention to London in 1871 where he exhibited seven oil paintings at the Annual International Exhibition. Further, as he and Mme Fesser shifted their travel plans to the region south of Paris in the Nivernais, Jongkind began exhibiting his work at the local Expositions des Beaux-Arts in Nevers, Orléans and Bourges in 1872. When his paintings were rejected by the Paris Salon in 1873, he simply stopped submitting his work there, recognizing that he was unlikely to be successful as long as the conservative values of the Ecole des Beaux-Arts dominated the art world of post-war Paris. Meanwhile, a number of Jongkind’s friends and colleagues were involved in the creation of an independent forum for exhibitions. The younger generation of painters, including Monet, had begun discussing this idea in the late 1860s, but it was not until December 27, 1873 that they officially incorporated the Société anonyme des artistes peintres, sculptuers, graveurs, etc”; their goal was to stimulate sales through a private exhibition free of juries and prizes. The show was scheduled to open in April 1874 one month before the opening of the Salon. Jongkind’s friend and art dealer, Pierre-Firmin Martin was the manager of this exhibition, which was held in the studio of another friend, the photographer Nadar. The public attention received by the 1874 exhibition is now legendary, giving rise to the term Impressionism, but the more important historical element in what has become a highly romanticized story is that this group of artists laid the foundation for an independent system of marketing and selling their work so that they could have a reasonable expectation of earning a living. Jongkind was fully supportive of this development, having had ample personal experience of struggling to pay expenses. Although he did not participate in any of the eight independent exhibitions, he attended all except one, advocating consistently for his friends’ efforts. The remaining years of the 1870s were a time of continued travels, but also of declining health for Jongkind. He had long suffered from a neurological illness that included periodic hallucinations and depression. The writer Edmond de Goncourt described a visit that he and art critic Philippe Burty made to Jongkind on May 4, 1871 in which they all enjoyed a pleasant conversation until Jongkind suddenly broke into a delusional rant; just as quickly, he came out of it, acknowledging that this happened to him from time to time. [viii] Although it is impossible to pinpoint the exact nature of Jongkind’s illness today, it is clear that it was a problem that plagued him throughout most of his adult life. Beginning in the fall of 1873, Jongkind and Mme Fesser traveled primarily to the south and southeastern areas of France, particularly the Dauphiné region southeast of Lyon on the border with Italy. Occasionally, they ventured further south to Avignon and Marseille as well, where Jongkind first experienced the brilliant light of Provençe. In 1875, Mme Fesser’s husband Alexandre died, leaving her a widow after many years of living apart. In the years that followed, she and Jongkind became very close to her son, Jules and his wife Pauline, visiting them often at their home near the château de Pupetières near Lyon where Jules was employed as a chef. By 1878, Jules decided to pursue his growing interest in photography and left his job at the château. He purchased property in the town of La Côte-Saint-André, where he set up a photography business. The Villa Beau Séjour property was not only large enough for the growing Fesser children, but also had space for Mme Fesser and Jongkind on their increasingly extended visits. At nearly sixty years old, Jongkind experienced a family life perhaps similar to his own childhood. He reportedly helped to educate the Fesser’s children, and seems to have been very much a grandfather to them. Jules also built a studio on the property where Jongkind could paint without interruptions or worrying about his materials. Gradually, he and Mme Fesser spent more time at Beau Séjour than in Paris. Throughout the 1880s, Jongkind’s work continued to attract positive attention, and his sales increased accordingly. An exhibition at the Gallery of Paul Détrimont on rue Lafitte, Paris in 1882 was a major success; and the following year, the Hôtel Drouot auctioned an art collection containing 83 paintings and 21 watercolors by Jongkind with excellent results. His financial woes were now completely behind him, and his delusional outbursts reportedly were rare. The last lengthy stay in Paris occurred from August 1886 to September 1887, after which Jongkind and Mme Fesser settled permanently at Beau Séjour in La Côte-Saint-André. Although they still traveled, including a visit to the monumental Exposition universelle in Paris in 1889 where the Eiffel Tower was unveiled, it was increasingly challenging as they entered their seventies. Jongkind’s old delusional demons returned in early 1891, and he was admitted to the psychiatric hospital in Saint-Egrève, near Grenoble at the end of January. He died shortly thereafter on February 9, 1891. Mme Fesser’s death followed on November 23, 1891. Both are buried at La Côte-Saint-André. [i] François Auffret, Johan Barthold Jongkind, 1819-1891, Héritier et Précurseur, Biographie illustrée, (Paris: Editions Maisineuve & Larose, 2004), 22. [iv] Jonathan Mayne, editor and translator, Baudelaire: Art in Paris, 1845-1862, Reviews of Salons and other Exhibitions, (New York: Phaidon Publishers, Inc. 1970) 220-221. [v] Charles F. Stuckey, Claude Monet, 1840-1926, ex. cat., (Chicago: The Art Institute of Chicago, 1995) 188. [vi] Unpublished letter from Monet to Gustave Geffroy, May 8, 1920, Documentation, Musée d’Orsay, Paris. Cited in John Zarobell, “John Barthold Jongkind” in Juliet Wilson-Bareau and David Degener, Manet and the Sea, ex. cat, (Philadelphia: Philadelphia Museum of Art, 2004) 173-175. [vii] See Louis Leroy, “Salon de 1863. IX: Les Refusés” in Salon to Biennial—Exhibitions That Made Art History, volume I: 1863-1959, Edited by Bruce Altshuler, (London: Phaidon Press, Ltd, 2008) 30. Leroy’s review was originally published in the journal Le Charivari, 20 May 1863. [viii] An extensive citation of this meeting can be found in François Auffret, Johan Barthold Jongkind, 1819-1891, Héritier et Précurseur, Biographie illustrée, (Paris: Editions Maisineuve & Larose, 2004) 194-195.